Ranging in color from deep red to white, the beet is a root vegetable that contains powerful nutrient compounds that help protect against birth defects, certain cancers and heart disease. Beets contain betalains—the pigments that give beets their colors—and there are two types of betalains: betacyanins and betaxanthins. In the body, betalains neutralize toxins and support the cell’s natural detoxification process. By preventing toxins from building up in the body and by preserving cell function, chronic inflammation can be avoided. Betalains also reduce the enzymes responsible for causing inflammation. Roasted beets are simply delicious and versatile. 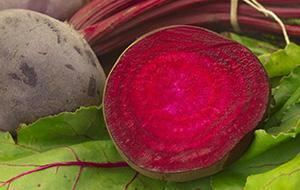 Use roasted beet cubes in a refreshing beet and citrus salad or for a colorful soup. Have you heard of borscht soup? The main ingredient in borscht soup is fresh red beets! A combination of assorted vegetables and/or meat and meat stock, borscht soup is originally from Russia and Poland but it’s a favorite of soup lovers, and it can be enjoyed hot or cold. For a beet dish with a pretty presentation use the chioggia beet—also known as candy cane beets. And for a delicious and nutritious smoothie, place 1 small roasted and chopped beet, ½ frozen banana, 1 ¼ cup low-fat milk, and 1 teaspoon honey into a blender; puree until smooth. Enjoy!